It seems an eon since Sachin Tendulkar, India's Prodigal son has blasted a bowling attack into oblivion. Over a career spanning two decades he has done this with regularity with a few lean patches thrown in between to remind us that he's only mortal. scream the banners across world stadia (his ardent followers turn up in all corners of the world). 'God' is showing alarming signs of age catching up. Having begun his Test career at a tender age of 16 years + something against Pakistan (among the most fearsome bowling attacks in cricketing history) way back in 1989 till date, his childlike passion remains the same and is clearly visible to the lovers of the great game. Whether his ability still matches upto the passion and hunger is another story. All evidence points to a decline in ability. 'Statistics are like Bikinis, what they reveal is suggestive, what they conceal is vital'. In the years 2011 and 2012 he has just one Test ton to show having played 14 Tests during that barren period. One ton per 3.3 tests as against the recent drought of one single ton to show in 14 tests. Form is temporary, class is permanent as the purists would say (I am one of his ardent fans). Statistics apart, his defensive approach against mediocre bowling as compared to his penchant for murdering renowned attacks in his heyday, unsure movement of feet, getting foxed by spinners he would have devoured maybe a few years ago..
Getting bowled in all his three innings against a less than fiery New Zealand recently should make even his die-hard fan sit up. When another Indian legend, Gavaskar, candidly pointed out the possibility of age catching up with Sachin, the criticism wasn't well taken by many others. 'This phase is temporary, he's been there before'. Much as I would like to believe this, one would do well to keep in mind that sport spares none, especially competitive Team sport. That's precisely the point: Legends like Viv Richards, Lara and Sachin have risen above the game: more often than not they have contributed to their Team when others have failed. That is cost of carrying the legend tag: expectations run high, you are not comparable with others, you have to constantly outperform not only the Opponents but also your own Team members: this is cost the legend has to pay for retaining the Halo. It was a sad day for world cricket, I recall, when Viv Richards (possibly the best player of his era) was dropped from the West Indies team- what an ignominious departure for the man with the swagger. We revere Sachin especially for his Match-Winning, never say die, buccaneering brand of Batting. No doubt, he has had to adjust his style and stroke play after injuries. There are other attacking batsman like Sehwag who have filled in his attacking role. Rahul Dravid heard the warning bell after just one dismal tour of Australia and gracefully called it a day (although he had a great series away in England earlier). 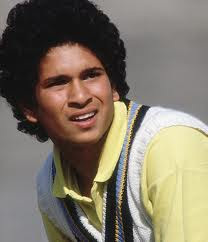 Sachin has been abysmal against England, the Aussies and now New Zealand. He already has the coveted, history creating 100th 100 and hardly has anything left to prove. Dread to see him facing the fate of the great Viv Richards.